Like many sensory materials, this one has several names. I've seen it all over, but from what I can tell it started with a mention by the Ooey Gooey Lady on Facebook and has been done by several bloggers at this point. 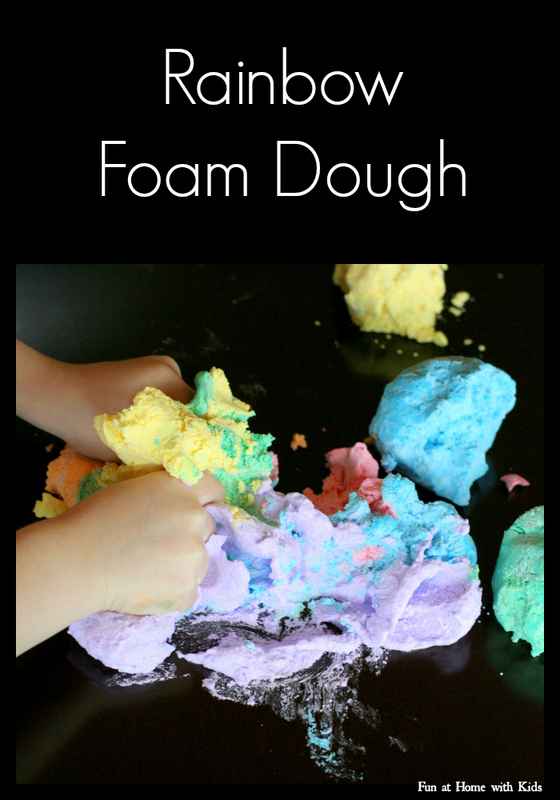 I always see this pin from Mom Trusted float by me on Pinterest - and now that I've played with the sensory material, I do think Foam Dough is the best name for it. Foam Dough has two ingredients in a roughly one to one ratio - cornstarch and shaving cream I wanted to make rainbow Foam Dough, because, well - rainbows!!!! So I started by coloring the shaving cream because I figured that would be easiest - I added Colorations Liquid Watercolors (What are Liquid Watercolors? ), but you could also use food coloring (this, coincidentally, is how we make Shaving Cream Paint). Then I slowly added cornstarch to each cup and stirred until it started looking ever so slightly doughy. We kept our dough on the wet side because it was so much fluffier. The more cornstarch you add, the drier the dough, but it does lose some of that amazing foamy-puffy texture. Ultimately I'd say our foam dough ended up being slightly more shaving cream than cornstarch. It really is just so foamy and puffy and fluffy and AMAZING. It's like touching a cloud or a marshmallow...or maybe a marshmallow cloud? Anyway, the pictures simply do not do it justice. It really was such a blast and so unlike any other material we've played with. We sincerely hope you'll give this one a try - it is something you must experience!!!! 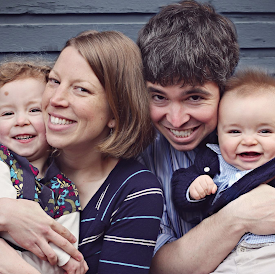 Follow along with us on Facebook, Google+, Pinterest or Subscribe by Email or Bloglovin'! Please always supervise your infant/child at play. Please stay within arms reach and never leave infants/children unattended. The colors turned out beautifully!!! :) I love your logic on rainbow colors too . . . makes perfect sense to me. 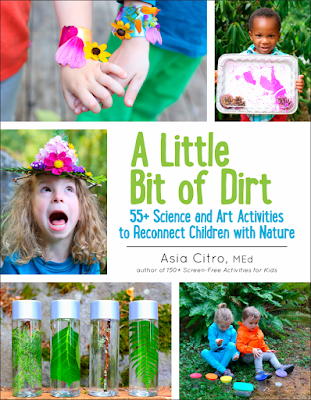 Can't wait to do this with my kiddo over the summer. 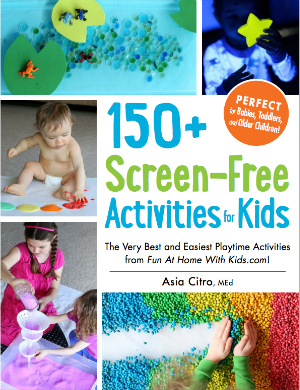 Thanks for sharing such a colorful, fun sensory play material! Asia, this stuff looks fantastic! We played with shaving cream yesterday too, but we just left ours plain and it was still a big hit. I know the hooligans would absolutely love it if we turned it into foam dough! Btw, I hadn't seen this idea before so thank you for the inspiration! Can you make anything from it that "lasts" or is it just to play with for the moment? Great question! We did not try to keep it. I would assume that since the shaving cream deflates over time that it would not keep, but I can't say for sure. My feeling is that it's very likely a play in the moment sort of dough. I've used it in a Preschool March Break Camps and Summer Camps. Instead of adding cornstarch to the shaving cream, we added glue. The kids made winter centerpieces during March Break which will last. For Summer Camp, we made "The Mayflower" sailing on the ocean. I made the Mayflower boat, they added masts etc. with pipe cleaners. They piled on blue shaving cream & glue, and plopped the Mayflower boat in it, Then they took paint brushes and created waves in the shaving cream. They turned out really cute, and the kids had a BLAST!!!! We made this this week, it was interesting and fun with new 3 year olds. Since shaving cream is not good to digest, I wonder... has ANYONE tried something like cool whip, or whipped cream??? HOW FUN WOULD THAT BE???? I haven't yet, Jodi Morris - but I bet it would be awesome fun if it worked the same - I know our little guy would love it if there was a safe version he could play with! Right! PLUS, it would smell good! Makes me want to go try it RIGHT NOW!!! This is good stuff! Oooooo I love this! I love anything rainbow, but the boys would totally dig squishing this stuff! Thank you, Play Create Explore! 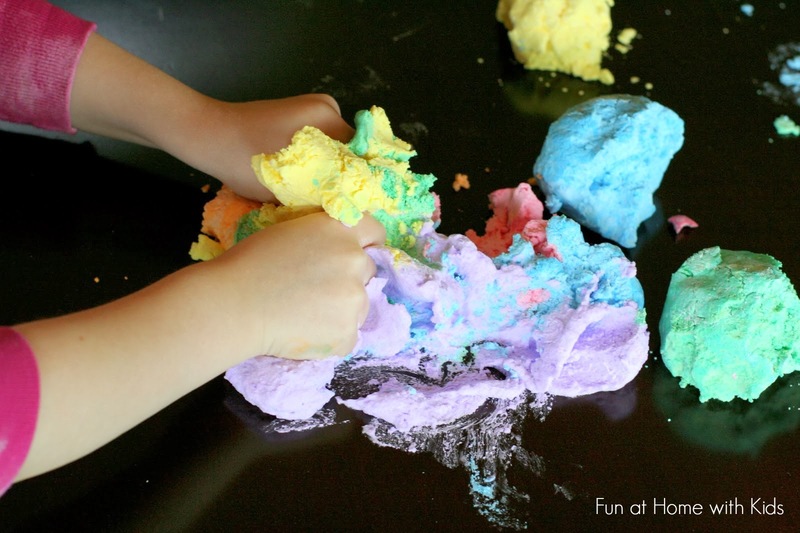 It is suuuper fun to squish and smash - and I know you and your boys are the best at messy play!!! Hi, I'm from the UK, is cornstarch what we would call cornflour do you know? And liquid colours-this is just paint in a bottle? I am not sure I will find these colours, they are gorgeous! Hi APerfectNanny! Yes, cornstarch is called cornflour in the UK (you want the thing that is used to thicken sauces). Liquid watercolors might be a bit tricky to find - you can easily sub food coloring for them. They are basically like liquid versions of washable watercolors. I like to use them in lieu of food coloring because the colors are lovely and they are washable. The company I buy them from is US based, though. I would look in an arts and crafts store over there to see if you can find something similar - or just use food coloring. It's SO puffy, Tracy! I bet they will love it! 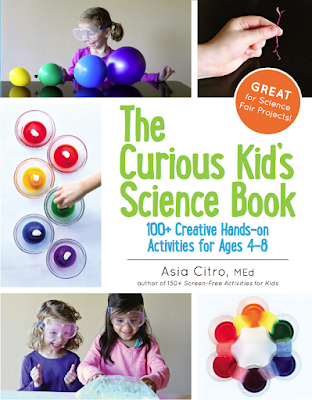 Will the food coloring stain the childrens hands? We use liquid watercolors, which are washable. However in my experience if you don't add too much food coloring it's not a problem. I just made this for my 3 year old with sensory processing disorder, and she is having a ball! She's asked me to make more 3 times already! I only made 3 colors (pink, blue & purple) but she's molding & getting messy - which is HUGE for her!!! Thank you! How much cornstarch did you end up using for one child? I need to make some for a much larger group, so I'm trying to figure out how much cornstarch I need. Ooh, that's a tough one. I think if you estimate 1 cup of cornstarch per child, you'll be good. I'm pretty sure that's an overestimate. I wish I knew more concisely!!!! My 4 year old daughter and 2 year old son did this today and loved it! We added some sprinkles for some extra flair along with the rainbow colors. It was perfect to play with on our water/sand table, and our water toys such as rubby ducky hopped in on the fun too. :) Thanks for the great idea! Oooh fantastic! I love the way you play - sprinkles would be so fun!!! Hi, i came across this activity yesterday and would love to use it for something school related. But i was just wondering how long you think the foam dough would keep for? Would i be able to make it the night before and use it the following afternoon do you think? :) thanks! You could, but it won't be as fluffy and puffy. It's more of a really soft crumbly dough after time goes on - it will keep at that stage for several days in a sealed container - and is still fun. The only downside is missing that super light and fluffy stage that only happens at the beginning. what a pity, I really love it, is there any way to preserve it? This isn't a recipe for model magic - that is an air dry clay. This is not a clay, but a fluffy dough. You can keep it in an airtight container for a few weeks, but if you're looking for a model magic clay recipe, this isn't one. Oh that sounds so amazing! I love it! In regards to my previous comment I see you commented 1 cup of cornstarch per child. How much shaving cream would you say with that one cup? About a cup of puffed up shaving cream (I just eyeball it, but you could dispense it into a measuring cup). It shouldn't be super goopy. I hope that helps! What can be a substitute for shaving cream as this is not permitted for use in my daycare? great idea! just tried with my kiddos but could not capture any photos. quite a mess lol! may i share yours, by giving credit you,of course? Thanks for asking! You may share ONE photo of mine only if you share a link to my post and do not share any directions or the recipe. If you share more than one photo or share a photo alongside my directions/recipe this is actually copyright infringement as per § 512(c) of the U.S. Copyright Law under the Digital Millennium Copyright Act (DMCA). I'm glad you enjoyed the activity! Can I use shaving foam instead of shaving cream?